After about a year of poking around, Zest has finally made it to be part of the GEF project. If you don’t know what Zest is, well it’s the technology that powers the Plug-in Dependency Visualization view inside the PDE incubator amongst other things. Ian Bull blogged about the view awhile back in case you’re interested in taking a peek. The code is finally located in the GEF repository and being built. The only things left to do are doing some documentation and website updates that I’m sure Ian will work on. Jokes aside, it looks like the Zest project will finally make its way into GEF. This is great news for the GEF project along for people interested in creating visualizations in Eclipse. So, look forward to seeing Zest in GEF in the future, for now, feel free to browse the snippets. It’s also important to note that Zest only depends on Draw2D which is tiny. I filed a bug against GEF to componetize the project a bit better so it’s easier to use Zest/Draw2D as they have minimal dependencies. 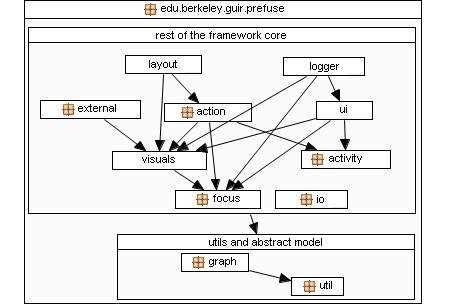 I came across the ispace project today which looks like a new EPL’d visualization toolkit. Just throwing this out there for people who are interested in visualization in Eclipse. Maybe ispace and the Zest project could get together and produce something cool. After talking to a few people (while imbibing some beers) and hearing Jeff Norris at the BlueSky BOF complain about how hard it is to visualize dependencies in RCP projects… I realized that in the base Eclipse SDK, we lack a fundamental and easy way for people to create visualizations (think Java2D). I think this is part of the reason we don’t see more visualization in Eclipse. In PDE, we have an incubator currently setup where we (thanks Ian!) are working on some visualization tools. The technology that we use to make this happen is called Zest. You can think of Zest as a lightweight MVC type wrapper on top of Draw2D (similar to how JFace operates on top of SWT). With Zest, you simply bring your model and work with the familiar constructs of content and label providers. I mean, it’s really easy to come up with a graphical editor (I will post a simple example in a future blog entry). What do people think? Do we need to strive to push this type of functionality into the SDK so more people will be able to use it without having to download some add-ins? If so, let’s file a bug and discuss it.